A 22-year-old Tesco worker who is one of the country’s youngest criminal judges faces a social media storm following an interview in which he said the role is “just about following your gut instinct”. Lawyers leapt on the line as confirmation of their worst fears about “amateur” magistrates, leaving Penney to protest that it had been taken out of context in a lengthy interview. Barrister Andrew Keogh commented “It’ll be Ouija Boards next”, while president of the West London Law Society Julian Young said “someone needs urgent training on the burden and standard of proof … very urgently”. Other lawyers refused to jump on the bandwagon. Solicitor-advocate Nicholas Diable said that “I think this criticism is way OTT. A single line that could easily be interpreted in different ways is being used to castigate someone who in every other part of the interview comes across as dedicated and responsible”. While Robin Murray, a former vice chair of the Criminal Law Solicitors Association (CLSA), said: “I don’t think it’s fair criticism to take one comment out of context. The bench are having a hard job recruiting at the moment and this is not going to help”. Taking to Twitter to defend himself, Penney said: “Just to clarify the wording I used on a BBC clip I participated in – I use the word gut instinct. I now see that this may be misunderstood and I could have expressed it better. This was my first TV interview for which I was nervous. Of course all evidence is considered to which a decision is made on the reliability of said available evidence. I apologise to anyone who may have doubted my ability”. Chief Executive of the Magistrates Association, Jon Collins, called the criticism “unhelpful and unfortunate”. Penney, originally from Neath, applied for the unpaid role as a magistrate after spotting a recruitment flyer in the store where he works. He completed a law degree in 2017 but tells Legal Cheek that he doesn’t harbour immediate ambitions to go into practice. The average age of a magistrate is just under 60. Of the 15,000 magistrates in England and Wales, just 92 are aged under 30. Official statistics show just one magistrate between 18 and 29 in the West Glamorgan area — presumably Penney himself. But Penney is not the youngest person ever to sit on the bench. Last year, Legal Cheek interviewed English student Nicky Stubbs, who became a magistrate aged 19. When a magistrate has to make a decision about conflicting evidence gut instinct does have a role to play. I’ve got two people both telling different stories. How do I tell who is lying? One was less consistent than the other. My gut instinct tells me that they might be the less credible. Makes perfect sense. I’d rather be tried by a bench of JPs than a DJ any day. Don’t agree. If the only thing you have to go on is gut instinct when trying to decide between two conflicting accounts, then you are not sure on the evidence and aquitt. If there is other evidence to support account A over account B then that would be different and you might well be sure account A is correct. Who said that gut instinct was the only thing he relies upon? What part of the word just are you having difficulty with? When assessing two contradictory pieces of evidence what is a magistrate supposed to do? One must be a lie. How do most of us assess whether some thing is a lie or the truth. We call upon our life experiences/gut instinct. I’ve had acquittals where police evidence has been rejected. Absolutely 100% wrong. You are obviously not a practising lawyer. It is frequently the case that two eyewitnesses have a contradictory recollection of the same incident. While it is *possible* one of them is lying, it is more usual that one (or both) of them is innocently and honestly mistaken. Another possibility is that a further piece of evidence comes to light that explains the contradiction and allows the two accounts to be reconciled. Life experience plays a huge part, but your black-and-white approach is the opposite of how things are in real life. I actually listened to the young man’s piece on the radio. He was engaging and articulate. And who do I think would out perform in the classroom, office or court room, you or the young magistrate/Tesco employee. Tesco employee every time. You’re clearly in the wrong profession. In your 50s? Doubt it. The LLButthurt is strong with this one. Only in a civil court. It is not the role of a Magistrate or a Jury to decide which account is correct. The Judicial oath and the oath taken by a Jury both require the fact finder to be sure that one account has been proved by the evidence to be true and one account has been proved to be false by the evidence. Hence the oath “to faithfully try the Defendant and return true verdicts according to the evidence.” In your example where there is literally nothing else to help you decide (ie no evidence) which account is correct, then neither account has been proved to be true so that you can be sure it is true and the verdict according to your oath is Not Guilty. Misunderstanding both the burden and standard of proof is a pretty basic error. 1. 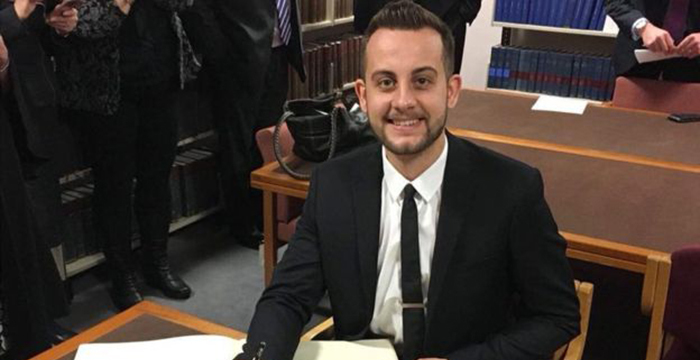 “one of the country’s youngest criminal judges ” – he is a magistrate, not a judge. 2. “My first case on the job was murder. ” – surely he was just sending it up to Crown Court – not a big one for the much criticised gut? Now imagine he’d acquitted the defendant of murder based on his gut instinct after looking into his beautiful brown eyes? He will be sat beside an experienced magistrate and another less experienced magistrate. Between them it’s unlikely a gut instinct will result in a group decision by the bench. Are the LC crew volunteers? I suppose those big name barristers are willing to volunteer in their spare time to be magistrates? Not allowed. JPs are meant to be non legally-qualified. There is nothing preventing lawyers being magistrates. I’d choose self service over this clown any day. Probably give myself life with no parole. I don’t care if they’re are young or old ; white or black ; men or women . As long as they are intelligent and fair and can overcome any prejudices and pre-conceptions they may have then I’m satisfied. Summary justice in the magistrates’ courts is often imperfect but I think most lay justices volunteer out of a sense of “civic duty” and not because of kudos or a power ego trip. I wish this young man well. Quite strange that amateurs are permitted to dole out justice. Why not simply appoint District Judges? Sounds like a case for abolishing juries. I can think of some lovely liberal countries that we could follow and do that. First problem is thst he’s on twitter at all as a member of the judiciary. It was also unforrunate that he condensed the whole body of the law of evidence into gut instinct. There are rules on how to treat evidence that is definitely not pure intuition. I experience DDJ’s on an everyday basis. This lad probably makes better decisions than they do. Well said. He had the confidence to appear on a national broadcaster and then front up on twitter to face his critics unlike the anonymous key board warriors. I suspect he has the last laugh – each day enduring some sad tired wannabe lawyer in a shiny suit, dog eared LPC guru notes in hand. We have ourselves a new Marvel Avenger. Gut Instinct Man. It’s extraordinary the kind of dross they let become magistrates these days. It used to be the case that only established pillars of local society would be magistrates; now apparently some spotty-faced pillock is considered mature, wise and responsible to pass legal judgement upon his fellow citizens. one who negotiated with Lee’s granddaughter Holly Foster-Wells for that life rights to Lee’s story. the star role using dedication needed to put it off? Two Lovers, June 30 – Tale became media frenzy of a working man who is torn between two girl. Get an Oscar goodie bag a person know you’ve made it in Hollywood. restaurants so on. Heck, who for you to be actually win the Oscar? fine but Think he has probably received just relating to right involving acclaim. star quality in his dramatic submit The Parent. “I think this criticism is way OTT. A single line that could easily be interpreted in different ways is being used to castigate someone who in every other part of the interview comes across as dedicated and responsible”.